Notes And Updates: We no longer sell the lights mentioned in this article. We recommend the Sylvania SilverStar and UltraStar replacement sbulbs which are availble at retailers where headlight bulbs are sold. 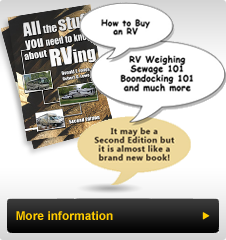 Newer RV's come equipped with headlight fixtures that require separate bulbs instead of sealed beams. Recently we have received comments that these lights are not very good and many requests for brighter bulbs. We also experienced the need for brighter bulbs in our (new to us) 2002 Bounder while traveling last summer. We were driving late at night through Iowa and noticed that the headlights were pitiful on low beam and superb on high beam. I concluded that they were out of adjustment and stopped in a small town on a side street and adjusted the lights, much to the neighbors chagrin. Somewhat improved visibility allowed us to continue, however the lights were not nearly as good as the high output halogen sealed beams in my old '94. Headlight systems have dramatically improved in the last decade and we are all used to better lighting in our towed vehicles. In February, I had some discussions with one of my suppliers and he informed me that they were introducing a new Ultra Xenon replacement bulb that has a light output close to the new High Intensity Discharge (HID) bulbs found on some newer luxury cars. Our Bounder was still in storage, so I ordered three sets of bulbs for my car, our Toad and my son Peter's car. Peter and I received the Ultra Xenon bulbs, and we installed Arctic White bulbs in our Toad. The latter bulbs are brighter than the high output halogen bulbs, but not as bright as the Ultra Xenon. Installation is a simple bulb exchange, however we re-aimed the headlights to clearly focus the brighter light. One piece of knowledge I learned in this process is that headlight bulbs are not all created equal. Some have lower wattage low beams than others while most high beam wattages are similar. This explains why some low beam lights seem better than others. The improvement was immediately noticeable. The whiter light allowed visibility along both sides of the road with reflective signs being very clear. Visibility increased to more than 250 feet (76 Meters) or an increase of 75 feet (23M). In fog, the road edges were easily distinguished and there was no stray light to blind oncoming traffic. Availability problems forced us to install Arctic White bulbs in our Bounder. I discovered that the headlight fixtures were significantly out of adjustment. The fixtures sit in a multi-adjustable bracket aimed through a cutout in the fiberglass front panel. The driver's side headlight was aimed too low, and could not be raised without re-adjusting the fixture. With another person to assist, I raised and centered the fixture and then adjusted the light using the internal adjustments. The immediate improvement was remarkable on low beam and superb on high beam. At the same time, the fog-lights were re-focused. They had been mounted parallel with the front panel which meant that the light beams from them diverged with the left aimed to the left and the right aimed to the right. They were also too low. We adjusted them to be at right angles to the side of the coach resulting in the outer edges of the lamps being more forward than the inner edges. The vast improvement in visibility and safety is reassuring. For the first time, I am not overdriving the headlights. If an obstruction is in view, I can make adjustments well in advance. For more technical information about the bulbs and their light characteristics go to the lighting page on our website and check out the fourth page. The solution for poor headlight visibility is twofold. Check your headlight adjustments and install either Artic White or Ultra Xenon replacement bulbs. These bulbs use some of the more rare halogen gases that use the same energy as conventional bulbs yet produce a whiter and higher light output. It is a small investment in safety that will give you peace of mind if you travel at night.